The Peace of Westphalia is considered by political scientists to be the beginning of the modern international system, in which external powers should avoid interfering in another country's domestic affairs. However, recent scholarship has argued that the Westphalian treaties actually had little to do with the principles with which they are often associated: sovereignty, non-intervention, and the legal equality of states. For example, Andreas Osiander[who?] writes that "[t]he treaties confirm neither [France's or Sweden's] 'sovereignty' nor anybody else's; least of all do they contain anything about sovereignty as a principle." 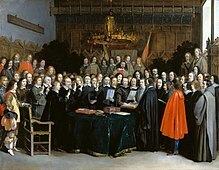 Others, like Christoph Kampann and Johannes Paulmann argue that the 1648 treaties in fact limited the sovereignty of numerous states within the Holy Roman Empire and that the Westphalian treaties did not present a coherent new state-system, although they were part of an ongoing change. Yet others, often post-colonialist scholars, point out the limited relevance of the 1648 system to the histories and state systems in the non-Western world. Nonetheless, "Westphalian sovereignty" continues to be used as a shorthand for the basic legal principles underlying the modern state system. The applicability and relevance of these principles have been questioned from the mid-20th century onward from a variety of viewpoints. Much of the debate has turned on the ideas of internationalism and globalization, which conflict[how?] with Westphalian sovereignty. The ratification of the Treaty of Münster, part of the Peace of Westphalia that ended the Thirty Years' War. The Westphalian peace reflected a practical accommodation to reality, not a unique moral insight. It relied on a system of independent states refraining from interference in each other's domestic affairs and checking each other's ambitions through a general equilibrium of power. No single claim to truth or universal rule had prevailed in Europe's contests. Instead, each state was assigned the attribute of sovereign power over its territory. Each would acknowledge the domestic structures and religious vocations of its fellow states and refrain from challenging their existence. The principle of non-interference in other countries' domestic affairs was laid out in the mid-18th century by Swiss jurist Emer de Vattel. States became the primary institutional agents in an interstate system of relations. The Peace of Westphalia is said to have ended attempts to impose supranational authority on European states. The "Westphalian" doctrine of states as independent agents was bolstered by the rise in 19th century thought of nationalism, under which legitimate states were assumed to correspond to nations—groups of people united by language and culture. After the end of the Cold War, the United States and Western Europe began talking of a post-Westphalian order in which countries could intervene against human rights abuses in other countries. Critics have pointed out such intervention would be (and has been) used to continue processes similar to standard Euro-American colonialism, and that the colonial powers always used ideas similar to "humanitarian intervention" to justify colonialism, slavery, and similar practices. China and Russia have thus used their United Nations Security Council veto power to block what they see as American actions to violate the sovereignty of other nations. The end of the Cold War saw increased international integration and, arguably, the erosion of Westphalian sovereignty. Much of the literature was primarily concerned with criticizing realist models of international politics in which the notion of the state as a unitary agent is taken as axiomatic. In 1998, at a Symposium on the Continuing Political Relevance of the Peace of Westphalia, NATO Secretary-General Javier Solana said that "humanity and democracy [were] two principles essentially irrelevant to the original Westphalian order" and levied a criticism that "the Westphalian system had its limits. For one, the principle of sovereignty it relied on also produced the basis for rivalry, not community of states; exclusion, not integration." In 1999, British Prime Minister Tony Blair gave a speech in Chicago where he "set out a new, post-Westphalian, 'doctrine of the international community'". Blair argued that globalization had made the Westphalian approach anachronistic. Blair was later referred to by The Daily Telegraph as "the man who ushered in the post-Westphalian era". Others have also asserted that globalization has superseded the Westphalian system. In 2000, Germany's Foreign Minister Joschka Fischer referred to the Peace of Westphalia in his Humboldt Speech, which argued that the system of European politics set up by Westphalia was obsolete: "The core of the concept of Europe after 1945 was and still is a rejection of the European balance-of-power principle and the hegemonic ambitions of individual states that had emerged following the Peace of Westphalia in 1648, a rejection which took the form of closer meshing of vital interests and the transfer of nation-state sovereign rights to supranational European institutions." The European Union's concept of shared sovereignty is also somewhat contrary to historical views of Westphalian sovereignty, as it provides for external agents to influence and interfere in the internal affairs of its member countries. In a 2008 article Phil Williams links the rise of terrorism and violent non-state actors (VNSAs), which pose a threat to the Westphalian sovereignty of the state, to globalization. Interventions such as in Cambodia by Vietnam (the Cambodian–Vietnamese War) or in Bangladesh (then a part of Pakistan) by West Pakistan (the Bangladesh Liberation War and the Indo-Pakistani War of 1971) were seen by some as examples of humanitarian intervention, although their basis in international law is debatable. Other more recent interventions, and their attendant infringements of state sovereignty, also have prompted debates about their legality and motivations. A new notion of contingent sovereignty seems to be emerging, but it has not yet reached the point of international legitimacy. Neoconservatism in particular has developed this line of thinking further, asserting that a lack of democracy may foreshadow future humanitarian crises, or that democracy itself constitutes a human right, and therefore states not respecting democratic principles open themselves up to just war by other countries. However, proponents of this theory have been accused of being concerned about democracy, human rights and humanitarian crises only in countries where American global dominance is challenged, while hypocritically ignoring the same issues in other countries friendlier to the United States. Further criticism of Westphalian sovereignty arises regarding allegedly failed states, of which Afghanistan (before the 2001 US-led invasion) is often considered an example. In this case, it is argued that no sovereignty exists and that international intervention is justified on humanitarian grounds and by the threats posed by failed states to neighboring countries and the world as a whole. Although the Westphalian system developed in early modern Europe, its staunchest defenders can now be found in the non-Western world. The presidents of China and Russia issued a joint statement in 2001 vowing to "counter attempts to undermine the fundamental norms of the international law with the help of concepts such as 'humanitarian intervention' and 'limited sovereignty'". China and Russia have used their United Nations Security Council veto power to block what they see as American violations of state sovereignty in Syria. Russia was left out of the original Westphalian system in 1648, but post-Soviet Russia has seen Westphalian sovereignty as a means to balance American power by encouraging a multipolar world order. Some in the West also speak favorably of the Westphalian state. American political scientist Stephen Walt urged U.S. President Donald Trump to return to Westphalian principles, calling it a "sensible course" for American foreign policy. American political commentator Pat Buchanan has also spoken in favor of the traditional nation-state. ^ a b "To protect sovereignty, or to protect lives?". The Economist. 15 May 2008. ^ Simpson, Gerry (2006). Great Powers and Outlaw States: Unequal Sovereigns in the International Legal Order. Cambridge: Cambridge Univ. Press. ISBN 9780521534901. The trajectory traced, in all this, describes a system developing out of the highly centralised and unequal relations that were the mark of the pre-Westphalian stage in international affairs to a Westphalian order in which the sovereign equality of states becomes a defining quality of the system. ^ Osiander, Andreas (2001), "Sovereignty, International Relations, and the Westphalian Myth", International Organization, 55 (2): 251–287, doi:10.1162/00208180151140577. Here: p. 251. ^ Gross, Leo (January 1948), "The Peace of Westphalia" (PDF), The American Journal of International Law, 42 (1): 20–41, doi:10.2307/2193560, JSTOR 2193560. ^ Jackson, R.H.; P. Owens (2005) "The Evolution of World Society" in: John Baylis; Steve Smith (eds.). The Globalization of World Politics: An Introduction to International Relations. Oxford: Oxford University Press, p. 53. ISBN 1-56584-727-X. ^ a b c d Kissinger, Henry (2014). World Order. ISBN 978-0-698-16572-4. ^ Osiander, op. cit., p. 267. For a different view, see D. Philpott, Revolutions in Sovereignty (2001). ^ Krasner, Stephen D. (2010). "The durability of organized hypocrisy". In Kalmo, Hent; Skinner, Quentin. Sovereignty in Fragments: The Past, Present and Future of a Contested Concept. Cambridge University Press. ^ Chomsky, Noam. "Lecture to the United Nations: The Responsibility to Protect". ^ a b Charbonneau, Louis (8 February 2012). "Russia U.N. veto on Syria aimed at crushing West's crusade". Reuters. But while Western governments and human rights groups welcomed enforcement of the concept of the “responsibility to protect” civilians, Moscow and Beijing did not hide their disdain for an idea they equate with violating states’ sovereignty, which the United Nations was founded to protect. ^ Camilleri and Falk, The End of Sovereignty?, 1992. ^ Cutler, A. Claire (2001), "Critical Reflections on the Westphalian Assumptions of International Law and Organization: A Crisis of Legitimacy", Review of International Studies, 27 (2): 133–150, doi:10.1017/S0260210500001339. ^ William Phelan (2015), "The Troika: The Interlocking Roles of Commission v Luxembourg and Belgium, Van Gend en Loos and Costa v ENEL in the Creation of the European Legal Order", European Law Journal, 21 (1): 116–135. ^ "Center for Security Studies, ETH Zürich". Retrieved 2018-12-18. ^ Michael Akehurst, "Humanitarian Intervention", in H. Bull, ed., Intervention in World Politics, Oxford University Press, 1984. ^ Olivier, Michèle (October 3, 2011). "Impact of the Arab Spring: Is democracy emerging as a human right in Africa?". Rights in focus discussion paper. Consultancy Africa Intelligence. Retrieved 2012-01-16. ^ Campbell, Polina. "The Role of International Organisations in the Russia-China Relationship". Culture Mandala: The Bulletin of the Centre for East-West Cultural and Economic Studies. 12 (1). ^ Ercan, Pinar Gözen (2016). Debating the Future of the 'Responsibility to Protect': The Evolution of a Moral Norm. Springer. p. 109. ISBN 9781137524270. For instance, in the recent example of Syria, countries like Russia and China vetoed draft resolutions arguing on the basis of system values. Explaining the reasons for Russia's veto on October 2011 Vitaly Churkin stated ... Of vital importance is the fact that at the heart of the Russian and Chinese draft was the logic of respect for the national sovereignty and territorial integrity of Syria ... Four months later, another resolution on Syria was yet again vetoed, and on behalf of China, Li Baodong emphasised that Syria's 'sovereignty, independence and territorial integrity [as well as] the purposes and principles of the United Nations Charter must be respected'. ^ Deyermond, Ruth (29 July 2016). "The Uses of Sovereignty in Twenty-first Century Russian Foreign Policy". Europe-Asia Studies. 68 (6): 957–984. doi:10.1080/09668136.2016.1204985. ^ Walt, Stephen M. (14 November 2016). "Could There Be a Peace of Trumphalia?". Foreign Policy. Is there a foreign-policy formula that is consistent with Trumpism yet not wholly destructive of the current international order? I think there is. That old idea is 'Westphalian sovereignty.' ... But will he follow this sensible course? This page was last edited on 9 April 2019, at 17:54 (UTC).